The purpose of Guided Reading Lesson Plan is to evaluate the comprehension of the students after reading a certain topic or subject matter. There are things needed to be filled out related to the reading material that will show the effectivity and interest of the students. The Sample Lesson Plan Templates are found in website template for free. It can be downloadable and printable once you select the appropriate reading topic for your students. It is in the form of Microsoft Word or PDF file. 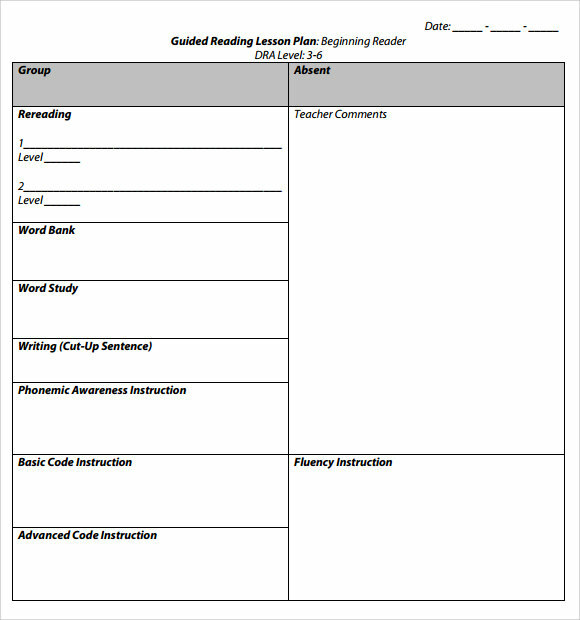 The guided reading lesson plan template is an effective and well-designed tool for education. This is a MS Word compatible template that comprises of a table enlisting the progress in reading skills of a student and the teacher’s remarks against it. The attributes can be customized according to the class level or the teacher’s name. This template features a table in which the row presents the various activities carried out in a reading class for school children and the corresponding column consist of steps to be taken by the teacher for improvement in their reading habits. This can be used as a to-do list while teaching in a kindergarten. The template is a simple gridded table displaying the list of topics to be covered or the number of days in a week against the corresponding report entered by the teacher. This template is composed of an assembly of horizontal and vertical lines making up a frame. Here the attributes can be highlighted and the corresponding observations or results are entered for analyzing the progress in a student’s reading. 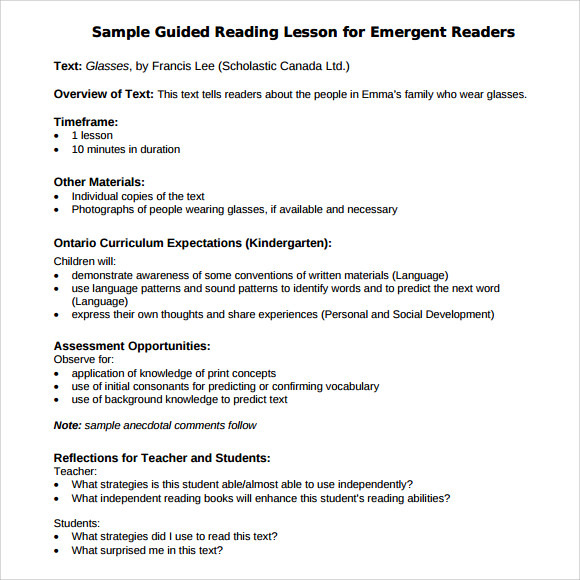 When To Use The Guiding Reading Lesson Template? Reading is a progressive habit that can develop with each succeeding day. 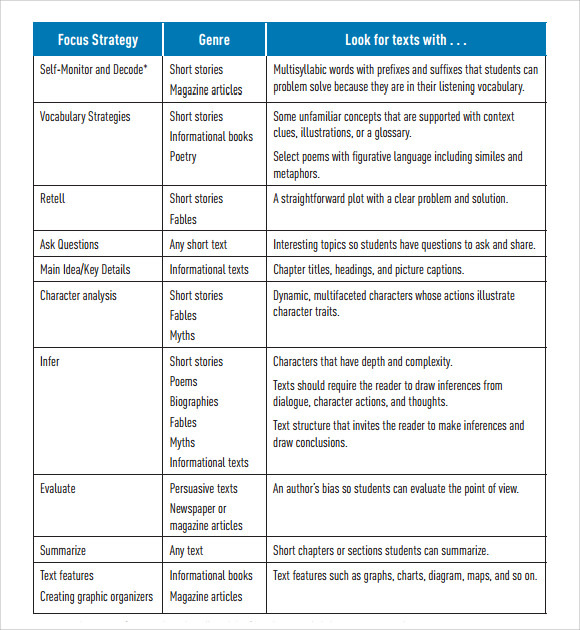 As notes need to be updated after every reading session, it can be a frustrating task to create table on a regular basis with the same attributes. 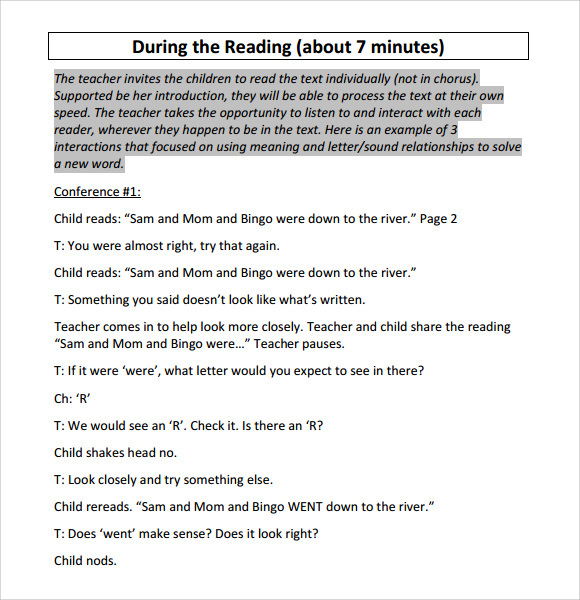 The Guiding Reading Lesson Template is used in such cases, to generate multiple copies of the same page or to customize some of the aspects according to the class level of the children. This can be used during classes or examinations to jot down comments while observing a child’s reading skills. Also, it can be employed during reading competitions as well and will need a new column to be added alongside. 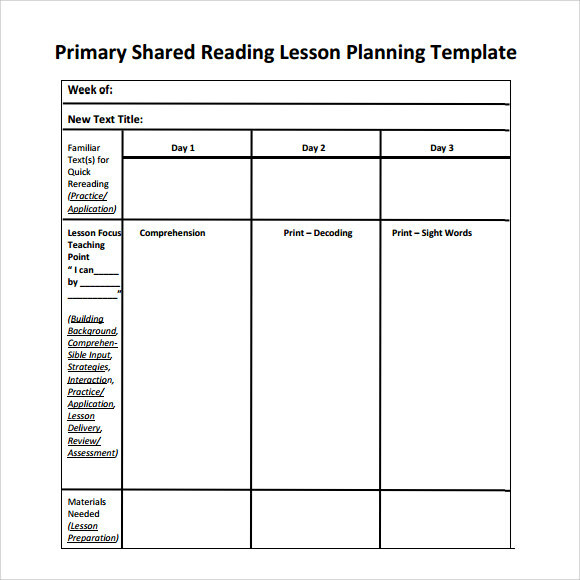 You can also see Unit Lesson Plan Templates. 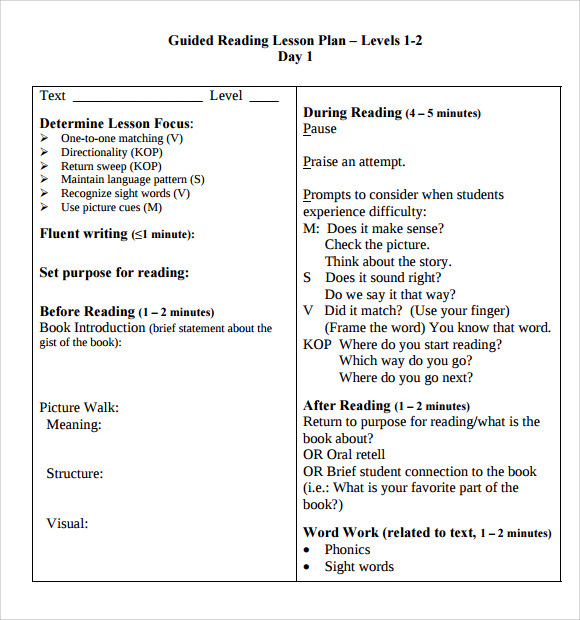 Who Can Use The Guiding Reading Lesson? 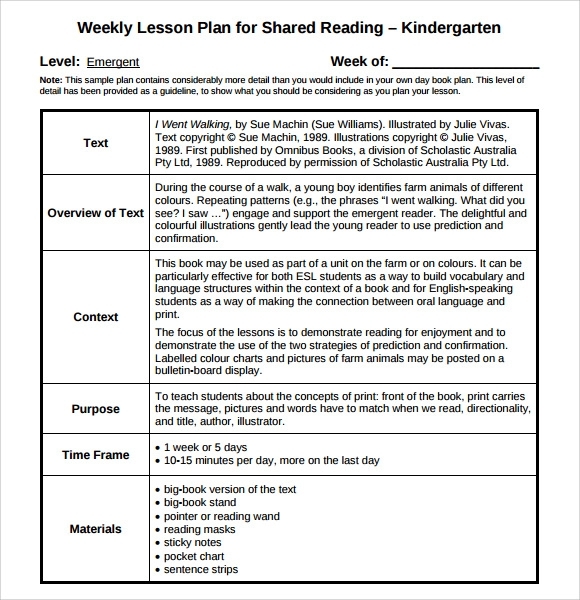 Any professional or parent supervising the reading habits of a student can use this template. Administrators of the school can use it to maintain a record of the teacher’s approach towards a reading session, they can inspect the trainer’s teaching qualities by analyzing the improvements seen in reading habits of the students. 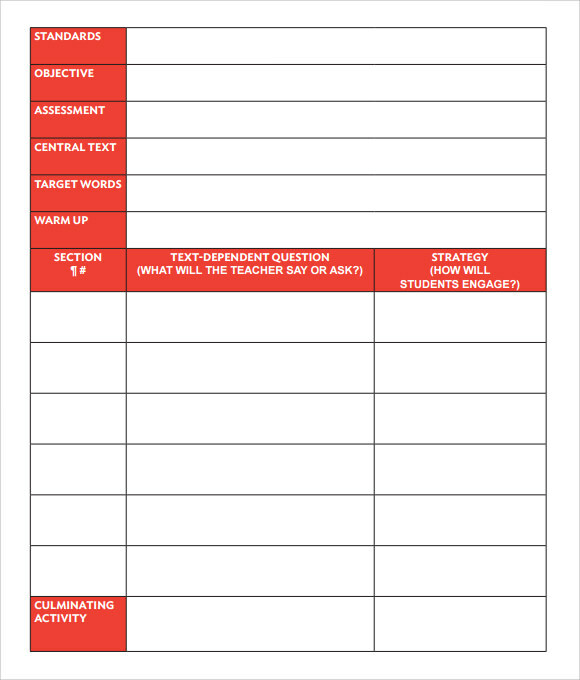 Exam invigilators can use this template to create a page enlisting all the key points they will cover while examining a student’s reading performance. A centralized authority of an institution or kindergarten can create a page using this Guided Reading Lesson Plans with a consolidated summary of the reading skills being taught to the children. 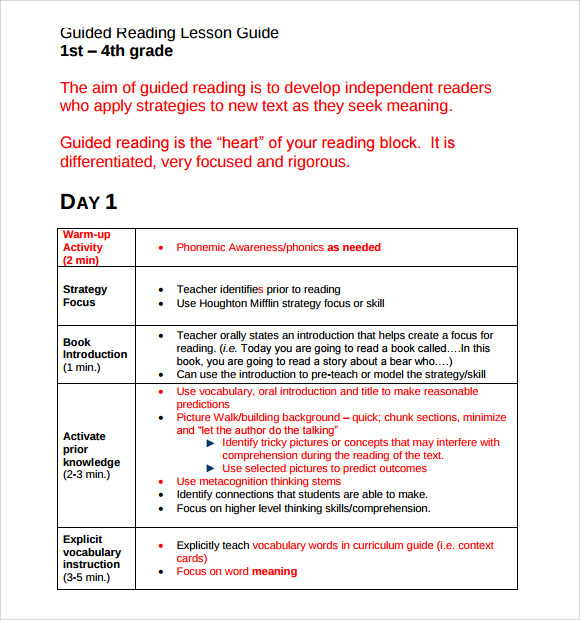 How to use the Guiding Reading Lesson? The template is easily available in the website, according to the type of chart or record to be maintained you can select the relevant template. After this, you can use it as a MS Word or PDF document. If the mentioned attributes do not suit the strategies followed in your institution, simply delete the existing one and add your own points. You can highlight the topics, or increase font size, add icons, increase the number of cells in a table or add some designs to the layout. The print ready template assures clear printout that can be circulated amongst teachers. Reading sessions for children have several aspects to be covered by teachers or tutors. Keeping a track of the student’s progress amidst all can be difficult if you need to create a page frequently. To avoid the usual confusion, switch to the simple, organized premade tables offered by this template.